The Indian Coral Tree or Tiger's Claw or Sunshine Tree (Erythrina variegata or Erythrina indica, as it was earlier known) is a beautiful native tree that has some remarkable flowers. 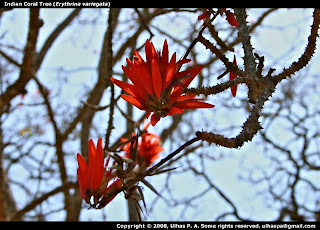 The flowers are long and brightly colored, the reason for some Erythrina sp. to be planted as decorative trees in gardens. The tree is visited by a host of birds including Mynas, Parakeets, Bulbuls and Sunbirds. One of those trees that is worth having in any garden! Hi, Ulhas. Enjoyed my visit to your blog. Especially enjoyed the history and ecology of the langur and the beautiful (but yucky smelling! )pink cassia. A nice visit to a different part of the world. Thanks a lot for your comment. I'm trying to get the blog going again. Hopefully this time around, I'll be able to post more regularly. Hi, Intresting commentary on the Indian Coral Tree. I am curious if this tree can be plated in a small garden. Is there anything else i should consider before planting this tree? You can plant this in your garden. There are specific garden varieties (like Erythrina coralloides) that may be better suited than the native tree.